The topping tail candle pattern deserves it own page and mention because of the immense predictive value that this pattern gives us. Whenever you see a topping tail candle appear, it often points to a reversal. Often times this candle pattern marks the top for the stock. 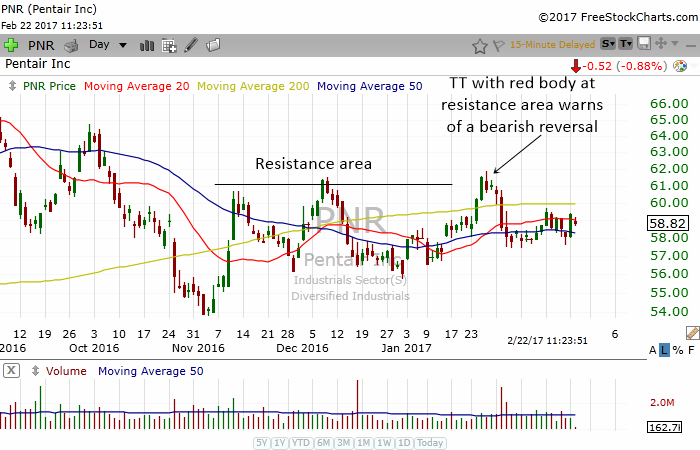 Being a bearish reversal candle pattern, this pattern offers us a potent signal when it happens at resistance areas. The topping tail can appear in many different forms and variations. Some have a red body indicating it closed lower for the day, some have green body indicating it closed higher than the open. Some have no bodies with the close and open at the low of the day and some with the close and open a little higher than the low of the day. They all have one thing in common. A very very long upper tail. And its very easy to spot them. If you have to take a magnifying glass and zoom into the chart to decide whether it is a topping tail or not then it is not a topping tail. Topping tails should be very easy to spot with the naked eye. The topping tail is indeed a very powerful bearish reversal signal. Whenever you see a topping tail form, you should always be ready for a reversal. If you are holding the stock, you might want to lighten your holding and sell some shares. 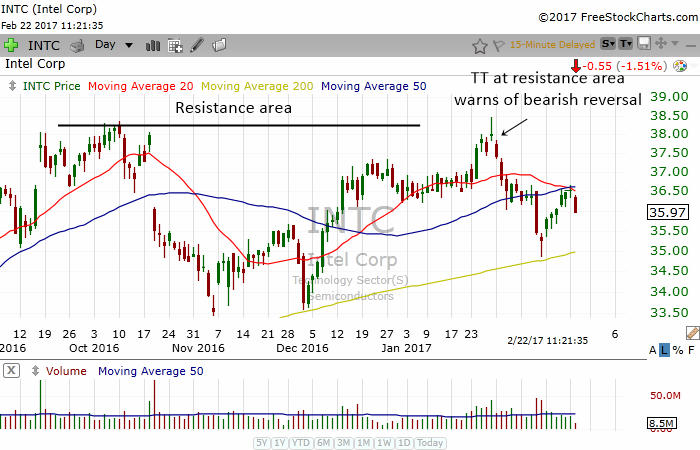 The chart above shows INTC forming a topping tail at a resistance area. When topping tails appear near resistance areas, it is a very potent signal for a reversal. Look how much the stock fell in the coming days. In the chart above, PNR also formed a topping tail at a resistance area. Although the topping tail was not a very clear one, it worked because it was a topping tail with a red body. The stock closed at the low of the day and this signal intense bearish strength. The stock fell the next few days. 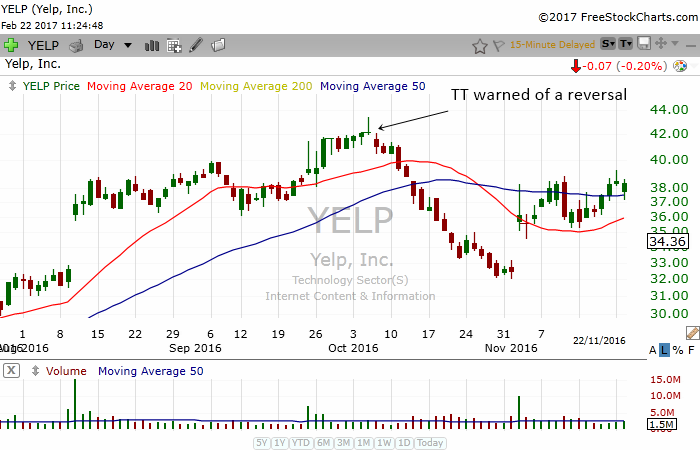 In the chart above, YELP formed a very clean topping tail. The stock initially look set for a very bullish run to the upside. But when the topping tail appeared, it told us that we should be very careful. The topping tail proved to be a very good signal to traders. Those who heed the warning would have avoided the severe drop the next couple of weeks. 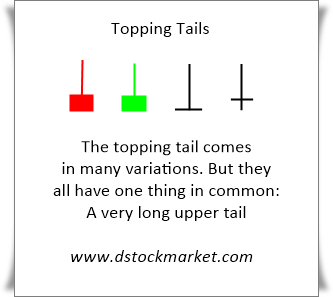 The topping tail candlestick pattern is awesome even in weekly charts. As you already know, the weekly charts shows us the trend and moves of a stock from a long term perspective. When you see a weekly topping tail appear, you should take note because it often warns of a bearish crash in the daily charts. 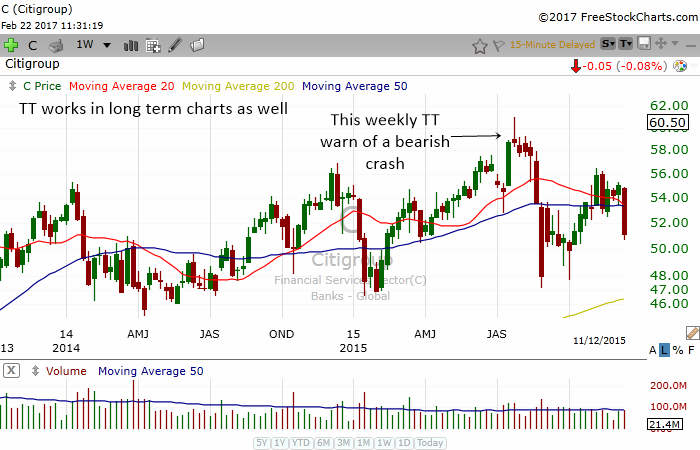 In the chart above, you can see how Citigroup had a very good bullish run in the year 2015. Then, a weekly topping tail appeared. Investors who took the warning that this topping tail gave would have sold some of their shares and avoided the devastating crash the next few weeks. 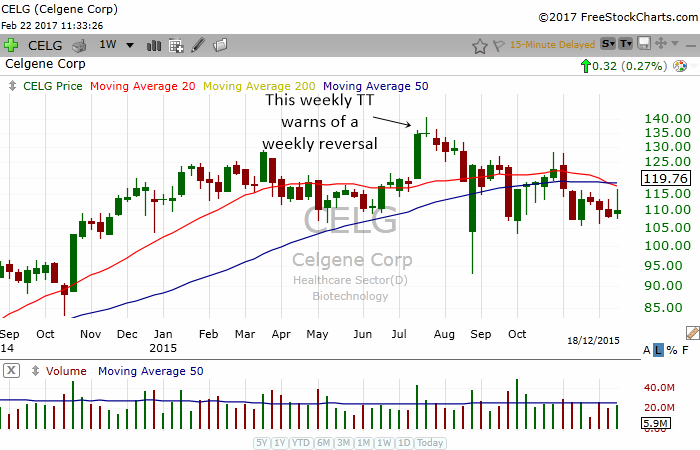 Similarly, in the chart above, you can see CELG had a nice bull run from June to mid July. Then a weekly topping tail appeared and warned traders of a bearish reversal. The stock had a bearish move the next few weeks and even drop as low as $95 at one point.